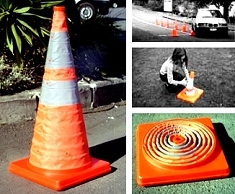 An absolute must for all road users, the PortaCone collapsible safety cone offers affordable protection for roadside emergencies such as collisions, breakdowns and flat tyres. It can be set up in a matter of seconds. Easily stored under the front seat of a car or in the boot (the 450mm model will even fit into a motorcycle pannier! 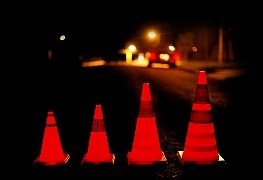 ), the PortaCone collapsible safety cone offers motorists the piece of mind when trouble occurs by making them easily visible to other drivers. 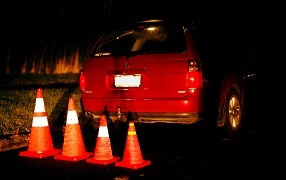 Portacone is a full sized, battery-operated flashing cone that folds into a 5cm stub in your boot when not in use. It can be seen by other drivers up to 1000 metres away! For domestic or industrial use (fire, safety, medical organisations), Portacone also makes an ideal safety partner as well as in office or industrial environments (wet floors, hazardous areas), and to mark off special areas at sporting fixtures or during recreational events. Portacones are available in five different sizes - 450mm, 500mm, 700mm, 750mm and 900mm - and comes standard with a built-in waterproof LED flashing light. The PortaCone PRO Series also features a special high impact PVC base for toughness, and four internal LED lights for maximum visibility.